What's this?! An announcement about an announcement? Consider my interest piqued, BioWare. I greatly look forward to whatever "exciting announcement" you may have planned in regards to the PlayStation 3 version of your upcoming video game Dragon Age: Origins! Also consider me tuned in this Friday, October 23 at 11 AM PST. I greatly anticipate whatever it is that BioWare co-founders Dr. Ray Muzyka and Dr. Greg Zeschuk have to say about the PS3 release of your spiritual sequel to the Baldur's Gate series. I may even ready some follow up questions for lead designer Mike Laidlaw and executive producer Mark Darrah. Now to ponder. What could they be announcing this late in the pre-release hype cycle? Is the PlayStation 3 version un-delayed, moved up a fortnight to release alongside its PC and Xbox 360 brethren? 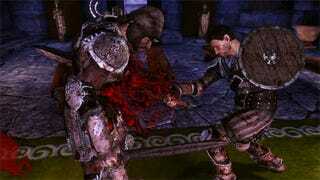 Will there be a Dragon Age: Origins Home space? Who knows?